When I was a young mom I thought raising toddlers was a challenge. And I’ll always remember my mother-in-law saying to me, ” Oh sweetheart, when they’re little they have little problems, and when they’re big they have big problems”. For many people, the thought of raising teenagers is intimidating and invokes feelings of fear and trepidation. But it doesn’t have to be that way. Although I’m still in the process of raising my youngest teenage son, I have two young adult children who I have a great relationship with and they are well adjusted. Although the teenage years were far from perfect we actually like our kids and have a fantastic relationship with each one of them. One of the major parenting philosophies we incorporated in raising our kids was making sure we had their hearts. This means not only knowing what’s going on with them but being involved in their lives. This requires knowing who their friends are and what activities they are involved in, but it also goes much deeper than that. It requires getting to their heart and knowing what is going on in their thought life and in their hearts. This means communication is key and making time to listen is critical. These are the same principles in the new book for parents Parenting Beyond The Rules by Connie Albers. 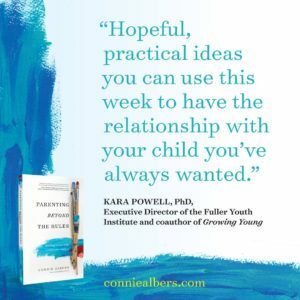 Connie shares stories from her own parenting journey and offers practical wisdom and effective strategies that you can begin to incorporate immediately to affect change. 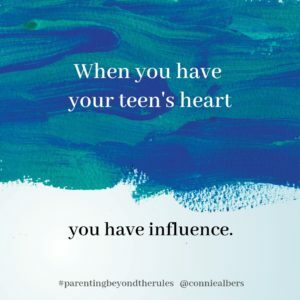 I believe it’s critical that we are in our kid’s world, not hovering like a helicopter mom, but being aware of what is going in their hearts and minds. When my oldest son was in high school and college we had heartfelt conversations and many that lasted late into the night. We always make ourselves available to our kids. Two of the most important chapters in the book are Understanding their World that talks about teens and technology, phones, social media, bullying and cyberbullying, and Listen Up the art of listening to our teens, resolving conflict and other important topics. If you are interested in making an impact on the next generation then this book is for you! If you have pre-teens and are unsure of the teenage years than this book is for you! If you are in the war for your hearts and minds of your children this book is for you! There is a war today for the hearts and minds of our young people and we must do battle on our knees for this generation and the ones to follow. 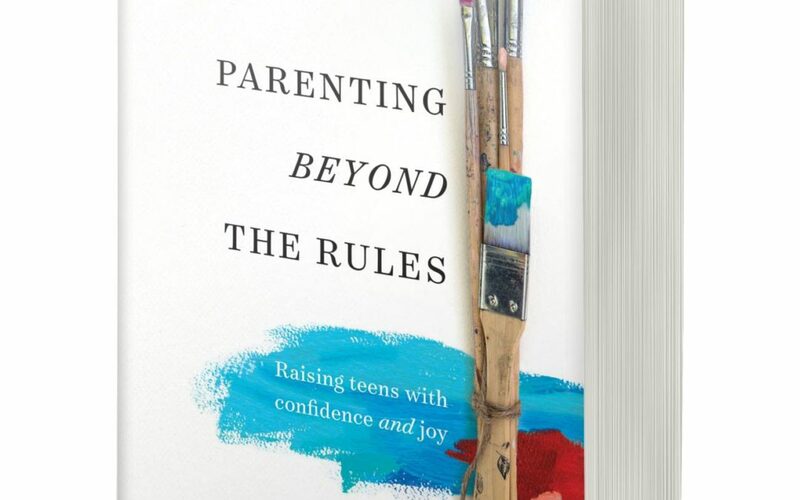 Parenting Beyond the Rules will equip you to parent your teens with wisdom and grace. I will definitely have to read this book! My kids are approaching teenage years and need to equip myself! Right now I’m reading the tech-wise family with research done by Barna. If we don’t teach our kids our kids will learn from the world! I have heard that is a wonderful book! I agree with you completely that we need to be the ones training our kids. 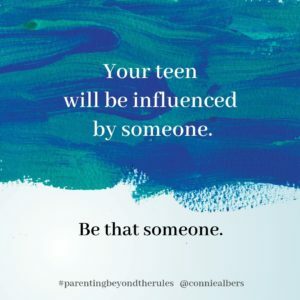 Connie’s book goes a step further to include communicating with your teen and having their hearts.